On Monday, reports that LG was prepping the Optimus G Pro for release during the first quarter of 2013 popped up, getting phablet fans excited. 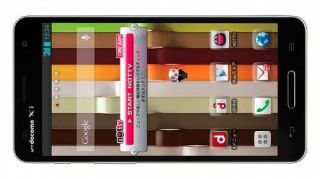 Luckily for all of them, the LG Optimus G Pro was more formally announced by NTT Docomo on Tuesday, ending speculation as to when and where the phablet would debut. Now set for a release in Japan this April, LG will enter an arena already filled with competition like the Sony Xperia Z, Huawei Ascend D2, and the possible Samsung Galaxy S4 and iPhone 5S. In addition to revealing the smartphone's existence, NTT Docomo also spilled the beans on the Optimus G Pro's specs. The Pro will feature a 5-inch 1080p IPS display, and will be powered by a 1.7GHz quad-core Snapdragon processor. Running Android 4.1: Jelly Bean should be relatively easy then for the Optimus G Pro, especially when adding in 2GB RAM, with 32GB of internal memory. There will be a microSD slot for expansion, as well as features like Bluetooth 4.0 and NFC capabilities. As one of 11 phones in NTT Docomo's 2013 line-up, the Optimus G Pro will be compatible with the provider's Xi LTE network, which offers the fastest 4G speeds in Japan. There's no word on a Western release, but perhaps next month's Mobile World Congress will provide some insights into LG's future plans for the Optimus G Pro.